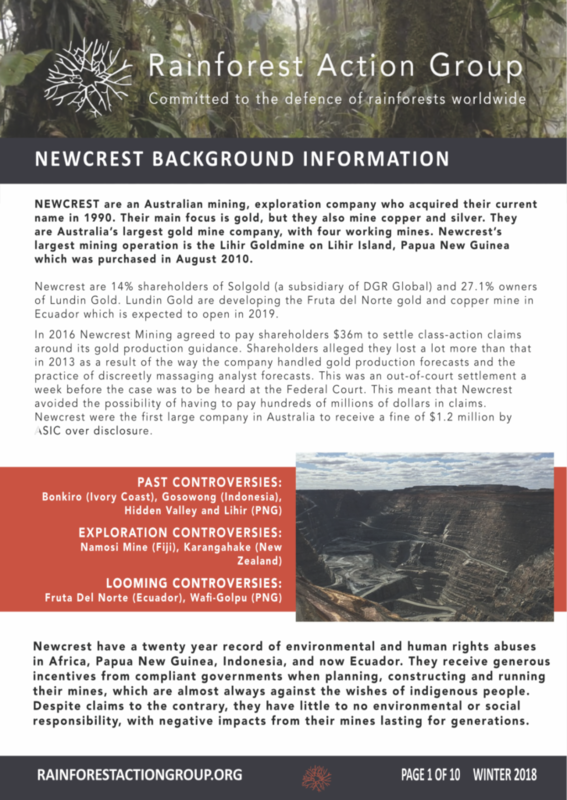 NEWCREST are an Australian mining and exploration company focusing on gold, but also mining copper and silver. They have a twenty year record of environmental and human rights abuses in Africa, Papua New Guinea, Indonesia, and now Ecuador. 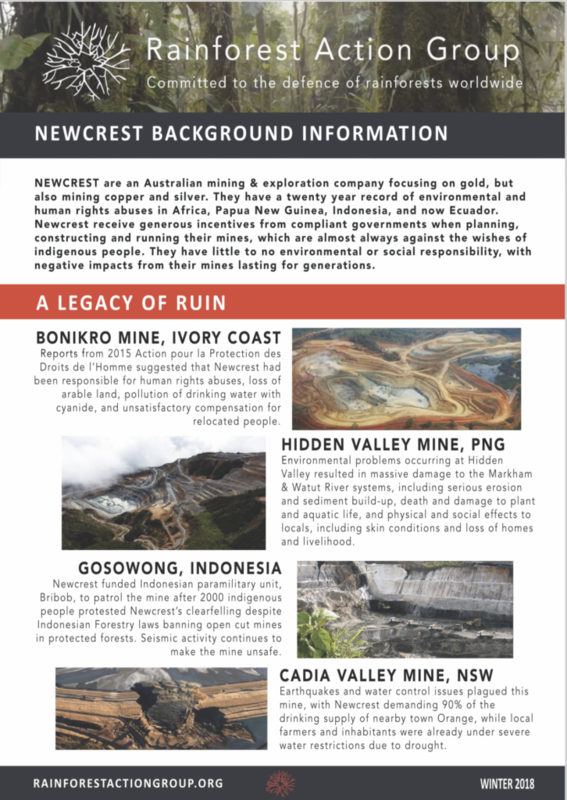 Newcrest receive generous incentives from compliant governments when planning, constructing and running their mines, which are almost always against the wishes of indigenous people. They have little to no environmental or social responsibility, with negative impacts from their mines lasting for generations. Newcrest are a 14% shareholder of SolGold (a subsidiary of DGR Global) and 27.1% owners of Lundin gold. 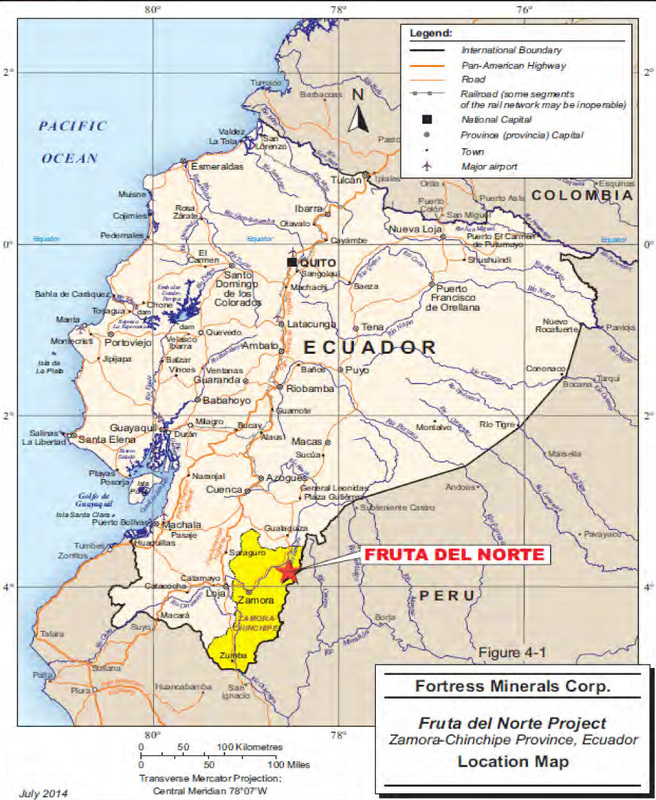 Lundin Gold is developing the Frute del Norte gold and copper mine in Ecuador which is expected to open in 2019. Current directors include: Sandeep Biswas, Peter Hay, Gerard Bond, Philip Aiken, Rick Lee, Xiaoling Liu, Roger Higgins and Vicki McFadden. In 2016, Newcrest Mining agreed to pay shareholders $36m to settle class-action claims around its gold production guidance. Shareholders alleged they lost a lot more than that in 2013 as a result of the way the company handled gold production forecasts and the practice of massaging analyst forecasts. This was an out-of-court settlement a week before the case was to be heard at the Federal Court, which meant that Newcrest avoided the possibility of having to pay hundreds of millions of dollars in claims. Newcrest were the first large company in Australia to receive a fine of $1.2 million by ASIC over disclosure. In January 2018, Newcrest bought a 27% stake in Lundin Gold's FDN project in Southern Ecuador to kickstart the mine. 75,000ha of land under concession includes indigenous lands and areas of extremely high ecological significance. Large-scale protests against the mine have been opposed by state security forces who arrest journalists and anti-mine campaigners. In 2017, the Worldwide Movement for Human Rights (FIDH) together with its member organisations in Ecuador: Comisión Ecuménica de Derechos Humanos (CEDHU), Fundación Regional de Asesoría en Derechos Humanos (INREDH) and Acción Ecológica, requested the Ecuadorian government cancel the licences, approvals and permits extended to the Panantza-San Carlos, Mirador and Fruta del Norte projects, as they had violated human rights, the territory of peasant communities and indigenous peoples, and caused massive damage to nature. 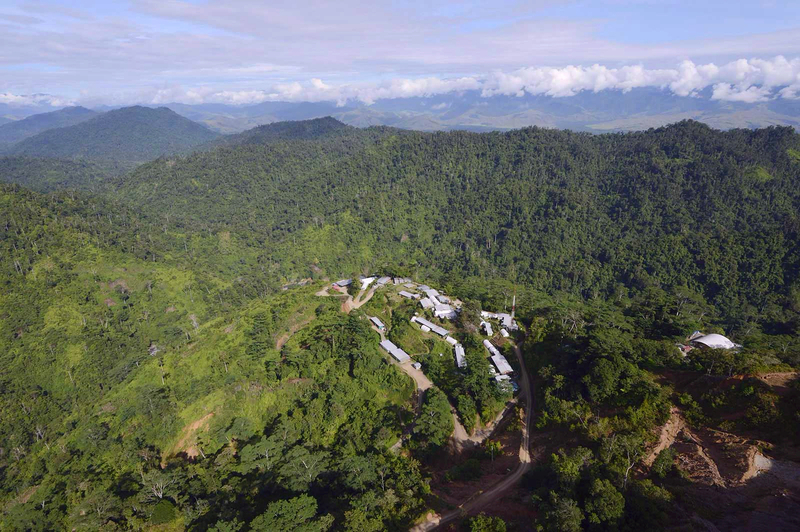 Located in the Morobe Province of PNG, Wafi-Golpu is planned to be one of the largest gold mines on earth. Newcrest and Harmony Gold share a 50-50 deposit in the mine, which appears dependent on the PNG Government buying a 30% stake. PNG’s first planned block mine, it includes 3 caves. Harmony/Newcrest are seeking approval to dump 60 million tonnes of waste into the Huon Gulf via a pipeline to the sea, as the Wafi-Golpu site is far too risky for a tailings dam, due to: “high seismicity and complex geology, including active faulting, which could at some sites result in liquefiable soils. Complex design would be required to partly mitigate such factors, and that would carry high risk and high cost in both construction and ongoing operation”. Reports from 2015 Action pour la Protection des Droits de l’Homme suggested that Newcrest had been responsible for human rights abuses, loss of arable land, pollution of drinking water with cyanide, and unsatisfactory compensation for relocated people. Environmental problems occurring at Hidden Valley resulted in massive damage to the Markham & Watut River systems, including serious erosion and sediment build-up, death and damage to plant and aquatic life, and physical and social effects to locals, including skin conditions and loss of homes and livelihood. Newcrest funded Indonesian paramilitary unit, Bribob, to patrol the mine after 2000 indigenous people protested Newcrest’s clearfelling despite Indonesian Forestry laws banning open cut mines in protected forests. Seismic activity continues to make the mine unsafe. Earthquakes and water control issues plagued this mine, with Newcrest demanding 90% of the drinking supply of nearby town Orange, while local farmers and inhabitants were already under severe water restrictions due to drought. Background information on Newcrest and its global operations. Detailed information on Newcrest, its directors and global operations.